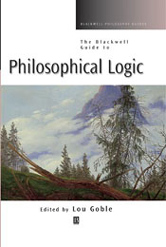 This volume presents a definitive introduction to twenty core areas of philosophical logic including classical logic, modal logic, alternative logics and close examinations of key logical concepts. - Takes the reader through a wide array of logic systems. - Offers a thorough explanation of the structures of logic systems and their motivations. - Serves as a valuable resource to numerous disciplines, including logic, philosophy, computer science, cognitive science, artificial intelligence, theoretical linguistics, and fundamental mathematics.